COLUMBIA, S.C. (AP) — Zion Williamson had an explosive NCAA Tournament debut with 25 points to lead top-seeded Duke to an 85-62 win over North Dakota State on Friday night. 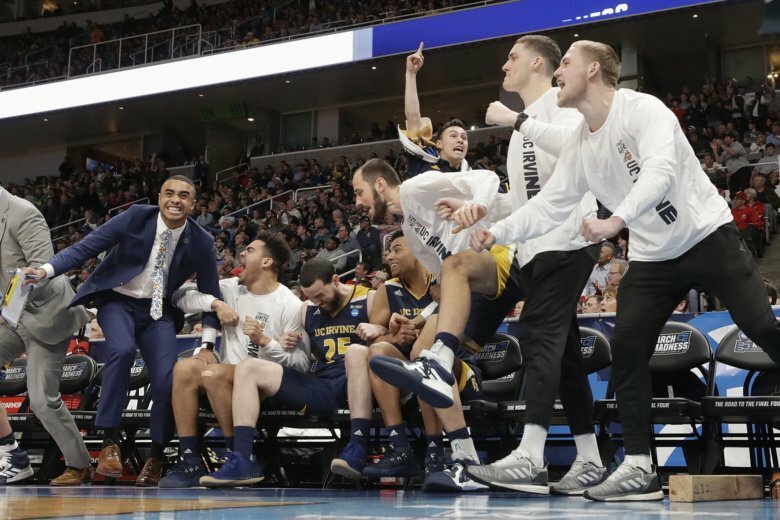 SAN JOSE, Calif. (AP) — Caleb Homesley scored 22 of his 30 points in the second half and Lovell Cabbil hit a go-ahead 3-pointer with 1:16 to play to send 12th-seeded Liberty to the first NCAA Tournament win in school history. SAN JOSE, Calif. (AP) — Payton Pritchard scored 19 points, Kenny Wooten protected the rim with four blocks, and 12th-seeded Oregon extended its surprising March run with a victory in the first round. COLUMBIA, S.C. (AP) — No. 1 seed Virginia rallied from 14 points down to beat No. 16 seed Gardner-Webb and avert another first-round exit as a top seed in the NCAA Tournament. Last year the Cavaliers were the top seed in the tournament and lost by 20 to No. 16 seed Maryland-Baltimore County. TULSA, Okla. (AP) — Ohio State went from barely making the NCAA Tournament to a spot in the second round with an upset of sixth-seeded Iowa State in the Midwest Region. COLUMBUS, Ohio (AP) — Cameron Johnson scored 21 points, and North Carolina quickly erased a five-point halftime deficit to hot-shooting Iona, going on to win 88-73 on Friday night. COLUMBUS, Ohio (AP) — Noah Dickerson had 20 points and 12 rebounds, and ninth-seeded Washington made a successful return to the NCAA Tournament for the first time in eight years. Eighth-seeded Utah State (28-7) had won 10 in a row and 17 of 18 while taking the Mountain West title. The Aggies got the highest seed in school history and were trying to end their own long NCAA Tournament drought — they haven’t won since 2002. TULSA, Okla. (AP) — Jarrett Culver had 29 points, eight rebounds and seven assists to help No. 3 seed Texas Tech shake off a slow start against No. 14 seed Northern Kentucky in the first round. COLUMBIA, S.C. (AP) — Rashard Odomes and Christian James scored 20 points apiece, Kristian Doolittle had 19 points and matched a career-high with 15 rebounds and No. 9 seed Oklahoma blitzed Mississippi with a season high in points in the first round. COLUMBUS, Ohio (AP) — Luka Garza scored 20 points, Jordan Bohannon made a three-point play during Iowa’s closing surge as the 10th-seeded Hawkeyes rallied past No. 7 seed Cincinnati in the first round. COLUMBIA, S.C. (AP) — Tacko Fall had 10 points, 18 rebounds and five blocks as ninth-seeded UCF won its first NCAA Tournament game. SAN JOSE, Calif. (AP) — Nickeil Alexander-Walker scored 20 points, Kerry Blackshear added 15 and fourth-seeded Virginia Tech earned its first NCAA Tournament win in 12 years. TULSA, Okla. (AP) — Corey Davis scored 26 points to help third-seeded Houston to victory in the Midwest Region.